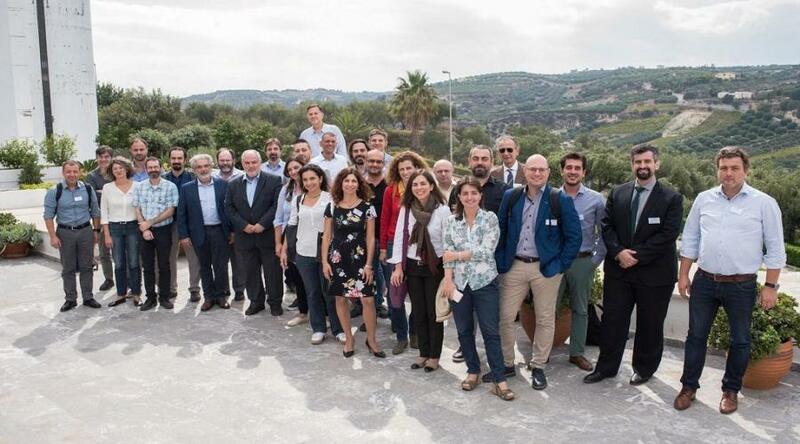 40 researchers taking part in the 1st International Conference of Greek ERC Grantees were given a chance to discuss and exchange opinions with members of the Scientific Council of the European Research Council. The 67th Conference of the Scientific Council of the European Research Council (ERC) and the 1st International conference of Greek ERC Grantees took place simultaneously at the Foundation for Research and Technology-Hellas (FORTH) in Irakleion Crete on 15-18 October 2018. 40 researchers from Greece and abroad participated in the 1st International Conference of Greek ERC Grantees. This was the first time Greek ERC Grantees had had the chance to meet, discuss and exchange opinions with members of the Scientific Council of the European Research Council. Professor Klaus Bock, Vice President of ERC, chairing this scientific council, stated, ‘The first conference for ERC Grantees was a great success- it presented an impressive range of the top scientific achievements of inspired Greek and European researchers. There was also a great deal of interesting interaction concerning the present and the future. Greek researchers, including those who live abroad, have performed well in ERC calls’. Professor Kostas Fotakis, Deputy Minister for Research and Innovation, an honoured guest, referred to the need to invest in the Knowledge Economy, and take measures to halt the departure of highly skilled human resources, by providing an attractive working environment and prospects for development. He mentioned the crucial role played by the Hellenic Foundation for Research and Innovation, created along the lines of the ERC, and expressed strong support from the Greek government for the ERC with respect to the EU’s next R&D framework programme, while noting the positive impact this has on developing national science policies in member states. The president of FORTH and member of ERC’s Scientific Council, Professor Nektarios Tavernarakis, referred to FORTH’s success in European funding and ERC: “FORTH is at the top, having the greatest number of ERC financed projects in Greece with funds of over 32 million euros”. 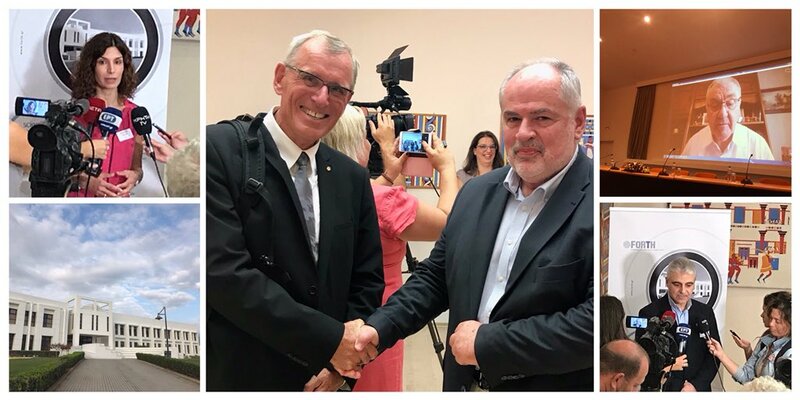 He noted too the role of this income in strengthening the local market as well as the link between research and production through the Praxi Network and the Scientific and Technological Park, Crete. The head of the Organising Committee of the 1st Conference for ERC Gerantees, Dr. Panayiotis Poirazi stressed ERC’s vital role in supporting young scientists saying, ‘The goal of the conference is the interaction between researchers, the development of co-operation and maintaining high level research performed in Greece and especially in Crete, with the support of Greeks from abroad’. The European Research Council (ERC) was launched in February 2007 as the first European organisation to fund the best scientists conducting pioneering research in Europe. It is the only European funding programme to grant individual researchers up to 2.5 million euros. It encourages interdisciplinary and sponsored research, which even if not directly intended for the market, is necessary for future technology (such as nanotechnology) or for dealing with environmental challenges (such as climate change). Since 2007, it has funded 70,000 researchers, 49 of whom were Greek. More than 180 top scientists have returned to Europe after being funded by ERC, which attests to the success of the programme in actively contributing to halting the brain drain. The National Documentation Centre (EKT) operates as National Contact Point for Horizon 2020 and a number of its individual programmes (such as ERC programme), supporting the participation of Greek academic, research and business communities. As part of its activities to map participation in European programmes, EKT publishes regular special reports and studies on Greek participation, such as the recent study on Greek participation in European Research Council (ERC) –Work Programme 2014-2017.